Idaho’s Water Quality Standards which are relevant to Hayden Lake’s impairment are deceptively simple: the lake will be free of certain materials and substances that may impair beneficial uses. The criteria in question include temperature, turbidity, bacteria, dissolved oxygen, nutrients, sediments, and known toxic substances. 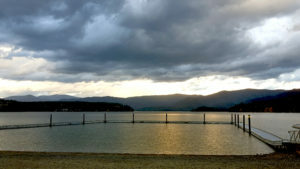 Hayden Lake is the home of cold-water-adapted aquatic life and salmonid spawning. It is a vital source of drinking water. And, it is a primary source for public recreation. These are the beneficial uses for which the state protects the lake. The earliest studies of the lake found that plant growth is phosphorus-limited. That is to say, plant growth uses up the phosphorus in the water before it uses up the nitrogen. The phosphorus concentration keeps plant growth in check. And, adding a little phosphorus can lead to a lot of extra plant growth. “At The Root Of Nutrient Limitation, Ecosystems Are Not As Different As They Seem.” ScienceDaily. Hayden Lake meets all criteria for preserving its beneficial uses, except for nutrients. The lake’s phosphorus concentration was (and continues to be) increasing. This upward trend feeds a chain reaction that eventually damages all of Hayden Lake’s beneficial uses. 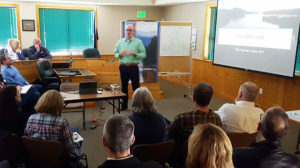 By designating Hayden Lake as impaired, IDEQ set in motion a different chain reaction; one that brings public and governmental support to halting the trend in phosphorus concentration and maintaining the high quality of Hayden Lake’s water. The TMDL (Total Daily Maximum Load) is the next link in the chain.